Those happy holidays are here and TDmonthly Magazine’s December toy videos demonstrate lots of new games and toys that'll let people stay warm and toasty indoors. Be sure to scroll down to see them all. Retailers: Did you know you can broadcast TDmonthly Toy Videos from your website? Manufacturers: Find out how a TDmonthly Video attracts buyers. See the rest of December's toy videos. From the company's New Yorker collection comes this 1000-piece jigsaw puzzle of the December 8, 2008, cover of The New Yorker magazine. Finding the humor in politics, this puzzle features art by Barry Blitt, with a drawing of President Barack Obama interviewing dogs to find his new pet. It is made in the USA from post-consumer recycled materials. "We make puzzles you'll want to frame and hang as art," Adam Silver, co-president of New York Puzzle Company, told TDmonthly. Launch date: May 2009. The Vermont Teddy Bear Company's Take Along Teddies feature a fun, flat design that makes them perfect for bedtime, travel or taking along on trips. These flat bears are handmade in Vermont and are unconditionally guaranteed for life. Injured flat bears can be sent to the Bear Hospital and the company will repair or replace them for free. Take Along Teddy is available in Cow Print, Espresso, Snow, Maple, Blue and Pink fur. Truth Be Told by BUFFALO GAMES INC. In this game for three to eight players, each round, the rotating Host reads his true answer to the given question card, along with everyone else's bluff answers, and players try to guess the correct answer to score points. An example of a question card is, "Truth Be Told, my favorite snack is _________." Bluff answers can also score points in this party game designed for fun and laughter. It includes 564 Truth Be Told questions on 141 cards, eight markers, eight fill-in-the-blank cards, eight paddles, a scoreboard and instructions. Launch date: Fall 2009 in select markets; 2010 nationwide. Design Your Own Sports Activities by JANLYNN CORP.
Other products from JANLYNN CORP. 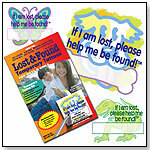 These temporary tattoos allow a child to remember his or her phone number if he or she becomes lost. All the child must do is look for the tattoo. The kit includes everything needed to apply and remove the tattoos. “Although other identification products are useful (ID bracelets, labels or wristbands) they can be removed and, therefore, are not as effective, Tattoos With A Purpose LLC President Cindi Aldrich told TDmonthly. “The temporary tattoos are available in fun styles for both boys and girls.” This product is a 2007 iParenting Media Award winner. Launch date: April 2004. With this game and candy in one, kids take the dare with the spin wheel, then pick the jelly bean in the color the spinner lands on to take a chance on tasting look-alike wild or mild flavors. There's a collection of 20 look-alike flavors, while others are the delicious Jelly Belly beans customers love. New for 2009 are Canned Dog Food and Centipede flavors, along with Booger, Baby Wipes and Pencil Shavings flavors, to name a few. Launch date: August 2009. Batter up with Sticky Mosaics®! Complete four fun filled pictures with our foil and foam stickers, then hang them on your wall. Includes four templates, four wall hangers, and over 2700 foil and foam sticky tiles. 2-Player Perpetual Commotion is the original Perpetual Commotion specially designed for two-player speed and excitement. Play as many cards as you can into a center Arena to earn points. Gain extra points by being the first to empty your Feeders pile—but watch out! A single roll of the eight-sided die can change your score. Get hooked on this card game of big fish and even bigger fish tales. Cast a lure card from your tackle box, then pick from your opponents' cards in hopes of landing the big one. Will you be able to see through their bluffs or will you get stuck with a soggy old boot? Reel in the most fish and you're the master angler. But catch only junk and you'll be left telling a story about the one that got away. Launch date: March 2009. — Gamewright games were listed as top sellers by Shana Hack, owner of Moon Rabbit Toys in Santa Fe, N.M., in June 2009. Somewhere between sand and clay in texture, Moon Sand can be molded, shaped and squished. 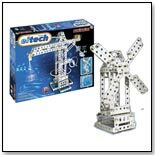 It never dries out so kids can re-shape it and play with it time and time again. 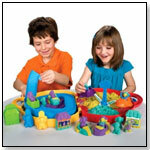 With this kit, kids use molds to create amusement park stands, children and bumper cars. There's even a roller coaster and spinning jet ride. When play is finished, everything fits inside the snap-shut carrying case. It comes with three 10-oz. bags of moldable Moon Sand (colors may vary). 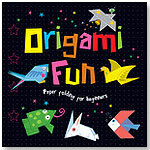 This beginner's origami book instructs kids on creating designs that include a spaceship, frogs, flowers and more. The 48 pages of instruction include color diagrams, and the back of the book holds 40 sheets of origami paper. A drawer in the book's spine opens to reveal six colored pencils and 12 decorative eyes that may be used to adorn the finished creations. The book measures 7.5" square. These 2" rubber animals have hard plastic eyes that pop out when the character's head is squeezed. The eyes then go back to their normal position. This series includes Holly the Hippo, Mickey the Monkey, Bobby the Bear and Parker the Penguin. Launch date: 2009. When ten little hedgehogs are surprised by some bad-news badgers, they have to roll together to reach the low spot in the hedge where mama hedgehog is waiting. Players help the spiny guys escape by rolling them safely past the badgers. There is only one way all ten can clear the hedge in a single roll. 50 different setups challenge players to foil the badgers. Velcro fasteners attach this trio of smiling bugs to baby’s infant carrier handle. Rich primary colors and high-contrast black and white geometrics are designed to catch the eye of even the youngest baby. 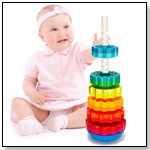 The bold patterns and symmetrical faces and bodies allow baby to focus, helping baby feel calm. The bee and dragonfly have shiny fabric wings with top stitching, and the ladybug has ridged corduroy wings. The wings crinkle to the touch, designed to to delight baby and encourage exploration. The dragonfly, bumble bee and lady bug can be moved to different spots on the carrier handle to give baby a different perspective. Each bug makes its own soft sound. When a toy is positioned to the side of baby’s head (and field of vision), it can be shaken to help baby seek the source of the sound. "This toy encourages visual development: it has high-contrast, geometric patterns, faces and bright colors and can be hung at a distance to fit baby's developing vision," Peggy Barrett, PR consultant for Barrett Marketing Communications, told TDmonthly. Launch date: July 2009. This set includes a Firefighter T-shirt with toy flashlight. Available in three sizes: small (3-4 yrs), medium (4-5 yrs), and large (5-6 yrs). These all-natural, cuddly bears are made with 100-percent wool, which is naturally flame resistant and hypo-allergenic, making the bears safe for all ages. They're stuffed with 100-percent recycled stuffing and are handmade in Vermont. They feature the signature "Born in Vermont" eyes and a "tush tag" confirming their unconditional lifetime guarantee. Launch date: November 15, 2009. This set includes a Police Officer T-shirt with toy whistle. Available in three sizes: small (3-4 yrs), medium (4-5 yrs), and large (5-6 yrs). These bears come from the Green Mountains of Vermont, but their cuddly soft fur and paw pads are made from 100-percent recycled post-consumer plastic bottles — the same fabric that goes into making some of the world's softest fleece and other cozy fabrics. They're made with 100-percent recycled stuffing. And just like all Vermont Teddy Bears, Go Green Bears feature "Born in Vermont" eyes and a "tush tag" confirming an unconditional lifetime guarantee. Launch date: November 15, 2009. 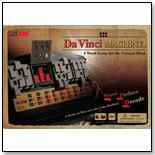 Inspired by the legendary genius Da Vinci, the product is a Code Machine that stretches players' imaginative and logical mind. It is a beautiful fusion of a Word game and a Logic game. 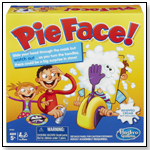 Its interactive game-play makes it a great piece for friends and family pastimes. The difficulty levels are controlled by players so it is also a nice adult-child educational toy. Over 270 parts! You can build at least 3 models. Illustrated instructions and tools included. Individuals can build a smooth, solid, 6”-diameter sphere out of 240 curved pieces. 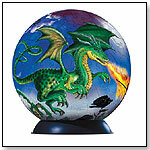 The ball stays together with no glue required, displaying a detailed and colorful image of fire-breathing dragons all over its surface. The puzzle comes with a display base to impress friends and family by showing off the completed ball. ― “Puzzle Balls from Ravensburger ... are really popular right now,” said Emily Bieritz, manager of My Favorite Toy Store in Downers Grove, Ill., in June 2009. ― Three of 47 retailers told TDmonthly in early summer 2009 that Puzzle Balls from Ravensburger are top sellers in their stores. The Jing Joe Cooling/Warming Infant Pad by PATONGCO LLC INC.
Other products from PATONGCO LLC INC. The Jing Joe Cooling/Warming Infant Pad is a 9.5" x 14" nylon pad with a built-in fan that draws in ambient air and delivers it out the front mesh spacer. The pad is design to fit easily in a car seat, stroller, swing or bouncer to provide a cushion of air for a child to sit up against that will keep them dry and comfortable without compromising the safety. "[An] opening on each side of the pad accommodates [the] shoulder strap so as not to compromise intended safety features, and also allows use of accessories, such as [the] padded head support and shoulder strap padding. Adjustment to the shoulder straps is required depending on size of the child," Anthony Tong, president of PaTongco LLC, told TDmonthly. The Jing Joe has received the following awards: 2009 Mom's Best Award; 2009 The Toy Man Seal of Approval; 2009 The Toy Man Award of Excellence; and 2009 The Toy Man Editor's Choice. Launch date: February 17, 2009. •2010: Year of the Dinosaur? •TDmonthly Charitable Kid Keeps on Giving!